The spinal cord is made up of nerves that relay messages back and forth between your brain and muscles and other tissues. It is protected by the backbone which is made up of stacked bones known as vertebrae. Spinal cord compression occurs anywhere from the neck to the lower end of the spine. Treatment varies depending on the severity of the compression, but it may include specific exercises. While gradual wear and tear remains the most common cause of spinal cord compression, other conditions may cause compression as well. Osteoarthritis, abnormal alignment of the spine, injury and infection are the most common causes. When compression occurs, symptoms include pain and stiffness, numbness, a burning pain and a loss of feeling in the feet. Improving neck strength and flexibility with simple exercises can decrease pain and might be recommended for basic treatment. One of the most basic exercises begins with sitting upright with both hands behind your neck. Gently bend forward, allowing the elbows to move toward the thighs. Continue the bend until you feel a stretch, and then slowly move back to an upright position. Repeat 10 times or fewer if experiencing pain. This simple exercise opens up the vertebrae and decompresses the spinal cord. A side bend also decompresses the vertebrae. Begin in a sitting position with a straight back and both hands behind your head. Gently bend to your right side, moving the elbow toward the hip to a mild stretch. Avoid leaning forward or backward. Slowly move back into an upright position and then repeat on the left side. This exercise can be repeated up to 10 times on each side. When spinal compression is localized in the lower back, aerobic exercise relieves the stress and also causes an increased release of endorphins, which are the body's natural painkillers. 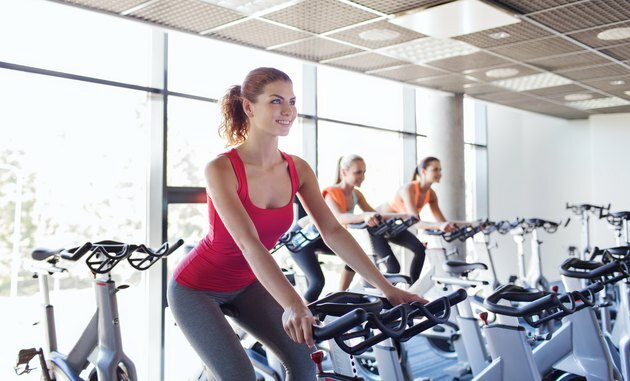 Riding a stationary bike as an aerobic exercise keeps the spine slightly bent forward and opens the spinal canal, decreasing spinal compression. Other aerobic exercises for this condition include walking or swimming, which have similar benefits for the spine.